A field of 16 will line up for Saturday’s handicap highlight at the Boylesports International, the £150,000 Boylesports.com Gold Cup (2.30pm) following the final 48-hour declaration stage. All eyes will be on Imperial Commander, the 7/4 market leader with Boylesports, who will be attempting to follow in the footsteps of Pegwell Bay (1988), Senor El Betrutti (1997) and Exotic Dancer (2006), by winning the Boylesports.com Gold and the Power Gold Cup in the same season following his impressive triumph at The Open last month. His trainer, Gloucestershire-based Nigel Twiston-Davies, also runs Patman Du Charmil. The weights for the two mile and five furlong contest are headed by this season’s Galway Plate victor Oslot on 11st 12lb, one of three declared runners for champion trainer Paul Nicholls along with Silverburn, the mount of stable jockey Ruby Walsh, and Nozic. Finger Onthe Pulse and Notable D’Estruval will both be trying to become the seventh Irish-trained winner of the Boylepsorts.com Gold Cup. Trained by Tom Taaffe, Finger Onthe Pulse can boast Cheltenham-winning form having taken the Listed Jewson Novices’ Handicap Chase over half a furlong shorter at The Festival in March while Notable D’Estruval landed a competitive handicap chase at the Punchestown festival in April. Nicky Henderson’s team has been in great form this season and is represented by the mare My Petra, an impressive winner at Ascot last time out and runner-up in the Johnny Henderson Grand Annual Chase at The Festival last season. Private Be represents the Philip Hobbs stable, successful four years ago with Monkerhostin, and the nine-year-old finished third to Imperial Commander in the Paddy Power Gold Cup while Three Mirrors also caught the eye in that race when staying on from off the pace to finish fifth. In 2007 Tamarinbleu provided trainer David Pipe with a shock 22/1 success in the Boylesports.com Gold Cup and this year the Pond House team run Abragante, who will be bidding to bounce back to form following a disappointing seasonal return at Ascot. Alan King is doubly-represented with Il Duce, fourth behind Imperial Commander last time out and The Hairy Lemon. The field is completed by Stan, successful over the same distance in the Grade Three Mears Group Silver Trophy at Cheltenham’s April meeting, Yes Sir and Nation State. Class 1, Grade 3, £150,000 Total Prize Fund. 2.30pm, Cheltenham, Saturday, December 13, 2008. For four-year-olds and upwards. Two miles and five furlongs (New Course). Penalties: after November 29, a winner of a chase 5lb - no penalty to increase a horse’s weight above 11st 2lb. Entries closed November 25, entries revealed November 26 (47 entries), weights revealed December 3. Five-day confirmation stage Monday, December 8 (19 remained). Final declaration stage 10.00am, Thursday, December 11 (16 declarations). Form figures supplied by Weatherbys and are correct up to and including Wednesday, December 10. The Boylesports.com Gold Cup was introduced at Cheltenham in December, 1963, three years after the successful Mackeson Gold Cup (now the Paddy Power Gold Cup) which is held the previous month. Originally under the sponsorship of Massey Ferguson, the very valuable and prestigious handicap chase had a number of sponsors before settling with the title, the Tripleprint Gold Cup, in 1992. In 2005, it was called the Robin Cook Memorial Gold Cup, in remembrance of the former Foreign Secretary and great racing enthusiast, who passed away in August of the same year. The first running under the Boylesports banner was in 2006. The Irish took the first three runnings, thanks to the efforts of Limeking, Flying Wild and Flyingbolt. The Tom Dreaper-trained Flyingbolt was an exceptional horse. After winning the 1965 Boylesports.com Gold Cup by 15 lengths under top-weight of 12st 6lb, he went on to The Festival, where he captured the 1966 two-mile Champion Chase and followed up by running third to Salmon Spray in the Champion Hurdle the next day. Flyingbolt took the Irish Grand National the following month under the huge burden of 12st 7lb to earn comparisons to his illustrious stablemate, Arkle. Illness and injury thereafter prevented the chestnut gelding from realising his full potential. Bob Turnell had two successes as a trainer, the first with The Laird in 1966, ridden by Jeff King. The Laird went on to be second in the 1968 totesport Cheltenham Gold Cup. His second winner, Arctic Bow, was ridden by his son Andy Turnell and they easily beat Soloning by six lengths for owner Jim Joel. Fulke Walwyn, one of the greatest-ever jump trainers, captured the 1968 running with Tassilo, while the admirable Titus Oates, trained by Gordon Richards and ridden by Ron Barry, defied 11st 13lb in 1969. Richards also trained two other winners, Clever Folly (1989) and Addington Boy (1996). Leap Frog, trained by Tom Dreaper, was another Irish winner in 1971 off 12st 1lb, after earlier in that year running second to L’Escargot in the totesport Cheltenham Gold Cup. The late Fred Winter gained the first of his three Boylesports.com Gold Cup wins as a trainer courtesy of the great Pendil in 1973. His other training successes were with Observe in 1982 and Fifty Dollars More the following season. Pendil won back-to-back King George VI Chases at Kempton Park in 1972 and 1973, and was just caught by The Dikler in the 1973 totesport Cheltenham Gold Cup. He is the only winner of the Boylesports.com Gold Cup to have also won the other feature race at the meeting, the Boylesports.com International, which he did in 1970. The late David Nicholson was responsible for sending out Another Coral to victory in the 1992 Boylesports.com Gold Cup. The nine-year-old received a marvellous ride from Richard Dunwoody to get the better of Second Schedual by five lengths. Norman Williamson was in the plate on Irish challenger Go Roger Go, who triumphed in a great finish in 2000, while the Irish enjoyed further success in the 2005 race when the Noel Meade-trained Sir Oj came with a storming late run to land the spoils. His 16/1 success saw him become the longest-priced winner since The Snipe triumphed at 20/1 in 1978. Mick Fitzgerald partnered the Nicky Henderson-trained Iris Royal to a head success over Risk Accessor in 2003 and the same partnership was successful in 2002 with Fondmort, who beat Foly Pleasant by six lengths. Fondmort became the seventh horse to win both the Paddy Power Gold Cup and the Boylesports.com Gold Cup, albeit in different seasons, when he was given another magnificent ride by Fitzgerald to land the first-named contest in 2003 by eight lengths from Poliantas. Richard Johnson captured his second Boylesports.com Gold Cup in 2004 when Monkerhostin capitalised on Our Vic’s last fence fall to stride home seven lengths clear of Thisthatandtother to give trainer Philip Hobbs an initial success in the race. Johnson’s previous Boylesports.com Gold Cup triumph came aboard Legal Right for trainer Jonjo O’Neill in 1999. 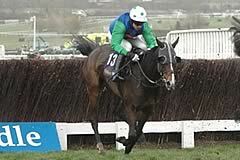 Exotic Dancer in 2006 captured both the Paddy Power Gold Cup and the Boylesports.com Gold Cup, becoming the eighth horse to complete the double. The Jonjo O’Neill-trained gelding demonstrated tremendous improvement throughout the season, taking the Letheby & Christopher Chase at Cheltenham in January and then finding only Kauto Star too strong in the totesport Gold Cup at The Festival before winning at Aintree. Last season saw the biggest shock in the history of the Boylesports.com Gold Cup when Tamarinbleu put up a superb front-running performance to record a 22/1 success. Trained by David Pipe and ridden by Denis O’Regan, the gelding’s victory was certainly no fluke as he went on to win a Grade One chase at Ascot and was also placed in Grade One contests at Haydock and Aintree. Senor El Betrutti (1997), Pegwell Bay (1988) and Exotic Dancer (2006) are the three horses to have captured the Paddy Power Gold Cup and Boylesports.com Gold Cup in the same season. * The Boylesports.com Gold Cup usually takes place over two miles and five furlongs on the New Course at Cheltenham. In 2003, because of the lack of rain over the summer and during the autumn, the handicap chase was run over two miles and four and a half furlongs on the Old Course at Cheltenham. * There have been 39 runnings, the first in 1963. Frost intervened in 2001, 1995 and 1976, snow in 1990 and 1981, while the 1967 event was lost due to a foot and mouth epidemic. * Limeking, trained in Ireland by Danny Morgan, won the inaugural running, defeating Flying Wild by two lengths. * In all, there have been six Irish-trained winners of the Gold Cup. The victories of Limeking (1963), Flying Wild (1964) and Flyingbolt (1965) ensured that the first three runnings all went to Ireland. However, no horse hailing from the Emerald Isle was successful between Leap Frog (1971) and Go Roger Go, victorious in 2000. Sir Oj became the sixth Irish-trained winner when successful in 2005. * Arkle, the greatest steeplechaser of all time and triumphant in the Cheltenham Gold Cup three times, suffered a rare reversal in the 1964 Boylesports.com Gold Cup. Anne Duchess of Westminster’s charge was saddled with the burden of 12st 10lb (which included a 3lb penalty for winning the Hennessy just seven days beforehand!) and finished a staying-on third behind the useful Irish mare Flying Wild (receiving 32lb) and Buona Notte (receiving 26lb). * The highest weight ever carried to victory in the Boylesports.com Gold Cup was the 12st 7lb shouldered by Pendil in 1973. Other notable weight-carrying performances were Flyingbolt with 12st 6lb in 1965 and Leap Frog with 12st 1lb in 1971. Pendil is the only horse to have also won the other major race at the Meeting, the Boylesports.com International, which he did in 1970. * In addition to holding the weight-carrying record for the Boylesports.com Gold Cup, Pendil also has the distinction of being the shortest-priced winner, being returned at 8/11. * Nine favourites or joint-favourites have won the Boylesports.com Gold Cup - Flyingbolt (1965, 5/2), Titus Oates (1969, 9/4), Leap Frog (1971, 3/1), Arctic Bow (1972, 9/2), Pendil (1973, 8/11), Fifty Dollars More (1983, 3/1), Oregon Trail (1986, 3/1), Kings Fountain (1991, 7/4) and Addington Boy (1996, 7/4). * A fancied horse - if not the favourite - usually wins the Boylesports.com Gold Cup, with 30 victors having been returned at single-figure odds, including 10 of the last 12. Last year Tamarinbleu provided became the longest-priced winner in the contest’s history when scoring at 22/1. * Female trainers have saddled the Boylesports.com Gold Cup winner three times - Auriol Sinclair with Simian (1970), Jenny Pitman with Bueche Giorod (1980) and the recently-retired Susan Nock with Senor El Betrutti (1997). * Gordon Richards and Fred Winter were the most successful trainers in the history of the Boylesports.com Gold Cup with three winners each. Richards sent out Titus Oates (1969), Clever Folly (1989) and Addington Boy (1996) while Winter had Pendil (1973), Observe (1982) and Fifty Dollars More (1983). * Among current trainers, Nicky Henderson and Jonjo O’Neill are the winning-most with two Boylesports.com Gold Cup triumphs each. Henderson scored courtesy of Fondmort (2002) and Iris Royal (2003) while O’Neill’s two winners were Legal Right (1999) and Exotic Dancer (2006). * Tony Dobbin became the fourth jockey to have ridden more than one Boylesports.com Gold Cup winner when partnering Exotic Dancer in 2006, having been on board Addington Boy in 1996. Richard Johnson won on Monkerhostin (2004) and Legal Right (1999), Mick Fitzgerald won on Iris Royal (2003) and Fondmort (2002), while Brendan Powell won on Pegwell Bay (1988) and Dublin Flyer (1994). * Senor El Betrutti (1997), Pegwell Bay (1988) and Exotic Dancer (2006) are the only three horses to have landed the Paddy Power Gold Cup and Boylesports.com Gold Cup in the same season. * Five other horses have won both of the very valuable handicap chases but in different years. Fondmort took the 2003 Paddy Power Gold Cup and the Boylesports.com Gold Cup the previous season, while Dublin Flyer (PP 1995, BS 1994), Another Coral (PP 1991, BS 1992), Beau Ranger (PP 1987, BS 1984) and Fifty Dollars More (PP 1982, BS 1983) also achieved double glory. * No horse has won the Boylesports.com Gold Cup twice.